Category trees are a little bit like wolfs in sheeps' clothings: They look pretty, sometime cute. But if you try to create great category trees, they will eat up all your time. So, what is a category tree: It is visualization of numerical data which is categorized in multiple ways. The category tree gives an overview of the most important sub categories first. Then it shows how these sub categories break down. For example, it can be used to show supplier spend data on spend category and sub category level as well as the top suppliers and countries per subcategory. Gathering all these numbers and compiling these Powerpoint slides is a huge copy/paste effort. You can imagine: Chances are high that something will go wrong. And if the underlying data changes, then it basically means starting from scratch. 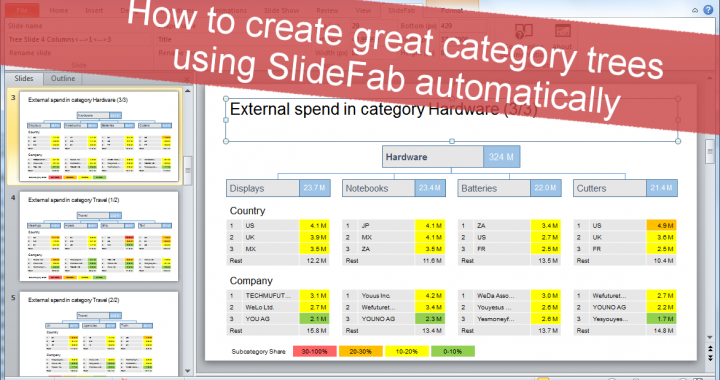 Fortunately, category trees can be created with SlideFab as well. As soon as Excel model and Powerpoint presentation are set up, the slides can be created within no time. So whenever data changes it will be a piece of cake to recreate the category trees. This means faster results with less time invested and also no manual copy/paste errors made. This short video shows in less than three minutes how this looks like and how it can be done. If you want to try it yourself, go grab the SlideFab trial version and download the category tree example from the downloads page. It is even possible to plug in your own data, just make sure to refresh the pivot tables after pasting your data. A longer tutorial explaining this example follows soon, it will go through the model and template and explain the underlying logic. If there are questions in the meantime, feel free to reach out.